Within a year or so of Jack Kirby's Challengers of the Unknown getting their own title in 1958, DC Comics introduced several new teams of non-super-powered adventurers: Cave Carson, Rip Hunter, and the Sea Devils. The latter two got their own titles in the early '60s, though neither of them matched the Challengers' success. 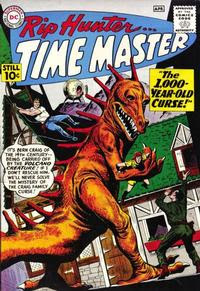 Rip Hunter, Time Master was published bimonthly from 1961 to 1965, running a total of 29 issues. The series was a relatively consistent seller (click to see the circulation reports), but never managed to achieve the same levels of sales success as its predecessor. Still, in a comic-book universe, a man with a time machine is simply too useful to abandon, and Rip Hunter has since appeared in a multitude of DC titles, including Challengers of the Unknown, Action Comics, and Crisis on Infinite Earths, as well as many other post-Crisis stories hinging on time travel. Rip even starred in his own eight-issue mini-series, Time Masters, in 1990 and is currently searching the timestream for Bruce Wayne in the six-issue Time Masters: Vanishing Point mini-series. What's really going on with the over-300 crowd?